As parents with a child who was recently in a modified school lock down because of a threat, Jani and I discuss gun law options, the Florida shooting and then talk to my youngest daughter about how she felt during her school lock down while Austin drops a bomb shell on a reason schools need to take things more seriously. We then try to lighten things up with Walking Dead body odor, Olympic events Facebook friends would like to see, the Dutch oven record breaker and more. Also, I actually remember to add the song dedication from my Allies overseas. Also, don't forget to find me at ECCC March 2nd for the D4ification contest and March 3rd with Cassie while we help out Costumed Characters 4 Causes and Camp Good Times. 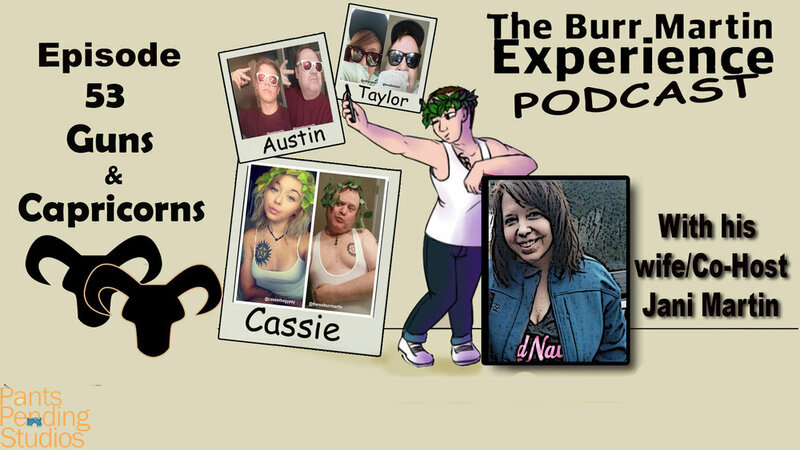 The Burr Martin Experience podcast, brought to you by Pants Pending Studios, is hosted by the Internet's "Selfie Dad", who was made famous overnight by recreating his daughters selfies on Instagram. Have you ever heard those shows where two parents toss witty banter towards each other as they talk about their kids for more than half the show? Well, this ain't one of those shows. This is what marriage with kids is really like.